The Beyond the Garden Gate tour features four private gardens and The Learning Garden, a demonstration and teaching garden at the Extension Office. Each garden offers unique opportunities for you to explore, learn, and grow. Make these gardens your destination on June 1. On tour day, come by the Asheville Visitor Center, located at the Chamber of Commerce, 36 Montford Avenue, Asheville, NC, to register and begin your tour. The tour is a self-guided, rain or shine event. Please—no strollers, pets, or smoking in the gardens. 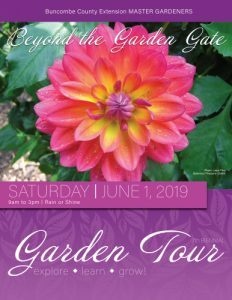 Garden tours raise money to support our programs, with emphasis on our School Garden Grants program. Since our first tour in 2007, we have given over $40,000 in grants to 50 different schools, allowing over 16,000 of Buncombe County children to become involved in healthy, outdoor learning activity. They are our future gardeners! A sneak preview of what you will see… Beyond the Garden Gate!